While Beijing’s policymakers are trying to boost growth by ramping up monetary and fiscal stimulus, the last thing they want is a rapid rise in inflation. So far, so good, as CPI and PPI inflation dropped in February. However, pork prices are destined to be in the spotlight in the “Year of the Pig”. In the days following Lunar New Year (LNY), pork prices tend to drop, but this year they surged by 8.4%, based on data from 22 provinces collected by the China Animal Agriculture Association, and by close to 40% from the low in the week of 18 May 2018. Considering the spread of African Swine Fever (ASF), a sharp fall in the number of breeding sows, and the limited space for ramping up pork imports, we expect pork prices in this new hog cycle to peak in January 2020. China’s monthly CPI inflation could rise towards 3.0% y-o-y at end-2019, and may peak at approximately 3.3% y-o-y in January 2020, which is when the LNY holidays will occur. That said, we believe the People’s Bank of China (PBoC) is unlikely to overreact to a surge in pork prices because it recognizes that a rise in CPI inflation driven by cyclical pork prices is not a monetary phenomenon and will naturally decline without monetary tightening; thus, it should not be treated as a real inflation risk. Understanding China’s hog cycles is important, as pork accounts for around 75% of total meat consumption and 12.5% of food consumption in China. In response to rising pork prices, pig farmers may raise more hogs, but too much new supply will, in turn, dampen pork prices. This phenomenon is especially evident in China, where pig farming is dominated by numerous small farms that are not sophisticated enough to predict prices. Due to this process, hog cycles usually last about four years. 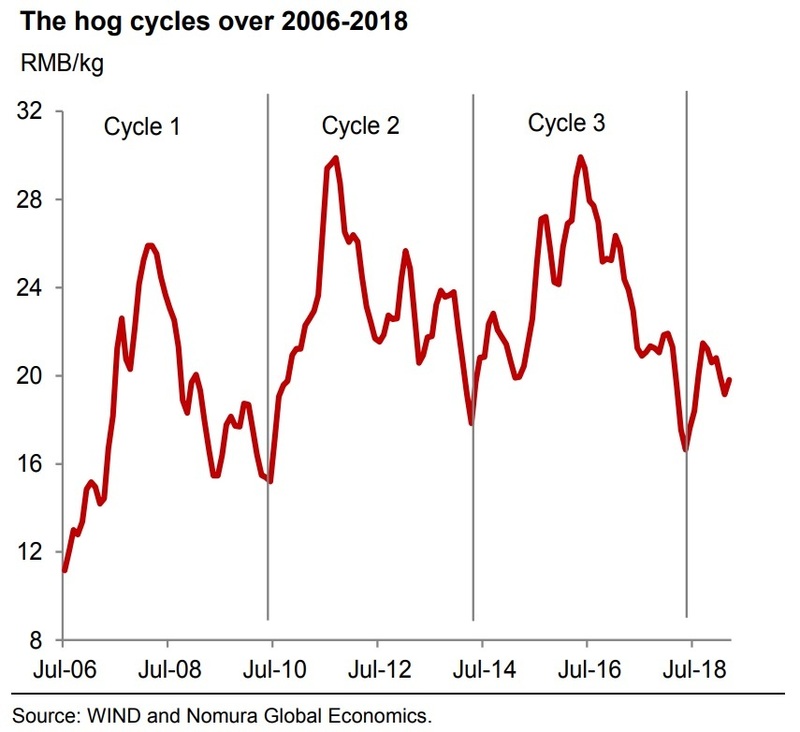 From 2006 to 2018, China experienced three hog cycles: cycle one in 2006-10, cycle two in 2010-14, and cycle three in 2014-18. We believe a new hog cycle has started after the average of 22-province pork prices bottomed in May 2018. However, the ASF outbreak in China in mid-2018 distorted markets. Although some hogs were killed at the beginning of the outbreak, pork supply actually increased, as concerns over the disease spreading pushed pig farmers to slaughter hogs early to avoid potential losses from the disease. Although we believe CPI inflation could be very close to 3.0% in certain months of 2019, the likelihood of annual CPI inflation breaching above this is quite small due to 1) the possibility of PPI inflation declining into negative territory in the coming months, and 2) value-added tax cuts potentially pushing down the prices of some consumer goods. To learn more about the impact of rising pork prices, read here. APAC technology: is there light at the end of the tunnel?